Nivea was too generous last Holiday season. Trust me! I got 2 packages sent by them and the LBC told our kasambahay that "Ang bait siguro ni Donna kasi ang dami niyang regalo!" hahaha Anyways, the first box was filled with Nivea lotions in their new packaging. Every brand has a story to tell, and NIVEA started its own more than 100 years ago. The brand was born in Hamburg, Germany in 1911, launching the world’s first stable water-in-oil emulsion that makes the perfect cosmetic skin cream for all skin types. But it was not until 1925 when the world was introduced to the iconic blue tin known as the NIVEA Crème – making it one of the most successful products of all time. More than its skincare expertise, NIVEA also takes pride in its resilience through the decades, as it continually creates connections with different age groups. It was probably the scent, or perhaps the velvety texture of its iconic Crème which resonates strongly with people of different generations. NIVEA, the world’s number one skincare brand, has touched the lives and skin of millions of Filipinos, now reveals a fresher, more youthful look in its all-new packaging, signifying that a smooth, touchable skin is always in style.The blue tin as the new logo. With the goal of strengthening its brand recognition through a familiar face, NIVEA decided to adapt the design of its best-selling and most-iconic NIVEA Crème product and restyled the blue tin to form the new brand logo. The brand has also banked on how the blue tin has been globally associated with superior care, quality, and trust. This year, NIVEA Body revamps itself, with a guarantee that 100 years of trusted care is still present in its new bottles. Through the years, NIVEA Body has remained committed to providing the best quality in skin moisturizing products. The brand also supports and provides for the need of users who know and believe that confidence begins with beautiful skin. “As a prominent and innovative global skincare brand, NIVEA recognizes the need to continuously adapt to changes over time and the latest trends in skincare, beauty, fashion, and even mindset. A new look is a starting point to showcase not only our products but also the values we stand for,” shares Alexander Schwieger, Country Manager for NIVEA Philippines. Being around for more than 100 years has made the brand witness to evolving trends and lifestyles of the world, allowing them to produce at least 80,000 print ads, 50,000 products, 7,000 films and over 50,000 photos. Creating a rich history of cultural diversities and transforming an insight on how the world has viewed beauty and style, the NIVEA way. “Our brand has connected to millions of people because we create an avenue that they can relate to – and it is through our advertising efforts. They see a reflection of themselves in our ads and films; they have been well represented. That is our relevance to our consumers. We have inculcated how being confident with the way you look is truly a NIVEA style,” adds Alex. 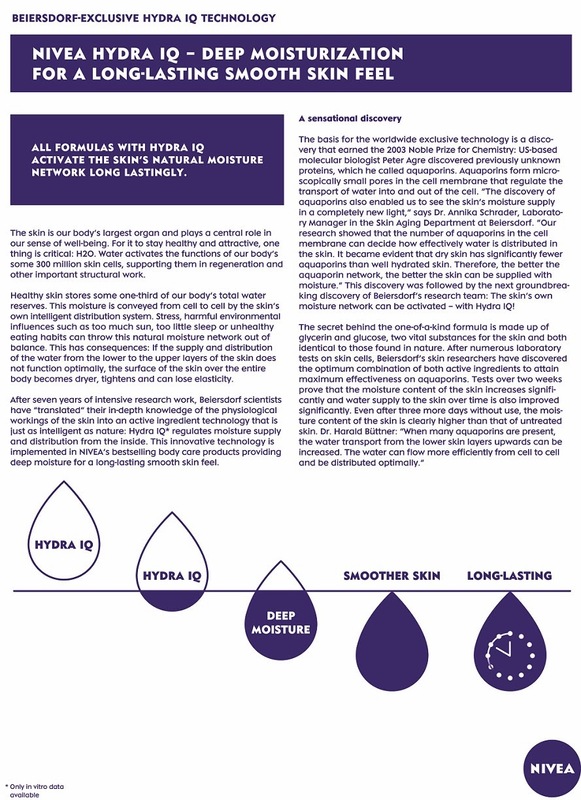 A proprietary feature of many NIVEA products is the revolutionary moisturizing ingredient, Hydra IQ Technology, a unique component found in all NIVEA Body lotions. This breakthrough formula activates the skin’s water channels to enhance its natural moisturization for more than 24 hours. Only NIVEA body targets to repair dry, dull, and sun-damaged skin, where continued use and application results in smooth, supple, and nourished skin starting from the deepest levels of the epidermis. “For over a hundred years of NIVEA’s strong presence in the global market, we have always shown that we evolve along with our customers’ needs. We develop, we innovate, because we care. Despite years of changes, our priority is always in style –to care for everyone’s skin, as if they were our own,” further adds Schwieger. Discover the new touch, new feel, and new look of NIVEA Body now at your favorite department stores, drugstores, and supermarkets nationwide. My mom loves lotion! Thus, when this huge box arrived she immediately told me "Oh was mo ito isama sa giveaways mo ah!" hahaha I certainly won't! I grew up loving Nivea too especially the Nivea Creme which was my first ever face moisturizer. Currently, I am a big fan of their Nivea Whitening Serum. I should really do a review of it. Another box came during the Holidays, this time, it is one of their Holiday Gift Sets!!! Weeehh!! Love the huge blue tin can! My brother and BF got the items for men. BF adores their deo. Thank you so much Nivea for the awesome treats. Last week I got the chance to join the Nivea Style Raid. With Nivea, it just takes 60 seconds to have smooth touchable skin. With the Hydra IQ Technology, NIvea boasts of long lasting hydration for 24 hrs. This idea brought about a style raid contest. Nivea partnered with brands like Forever 21. The contestants should get 24000 pesos worth of clothes in just 60 seconds. I badly wanted to win. hahaha As in.. I got too excited that my loot cost more than 26000!! Talk about being hyper at 8am!! Thus, I ended up being a loser but I did not went home empty handed. Thanks to Nivea for the Consolation prize of 2000 got these items from Forever 21. It took me more than an hour searching the store. Got these discounted items with a further reduction of 30% off. Isn't that amazing? Thank you Nivea for these awesome treats and wonderful opportunity. My mom introduced me to Nivea body lotion when I was a teenager. Up until now in my late 20's I prefer Nivea as my body lotion. I've tried other lotions, but I always go back to Nivea. :) I love there new packaging! 100 years of caring for our skin and hair makes Nivea really a trusted brand by many. Whoa I can't believe that Nivea has been selling their products for over 100 years now. It's nice to know that it came from Germany. I've always trusted Nivea's sunblock, but that extra whitening, I might try. And yeah, my brother likes to use their face wash. Ako naman, di ako hiyang sa Nivea pag dating sa facial products. 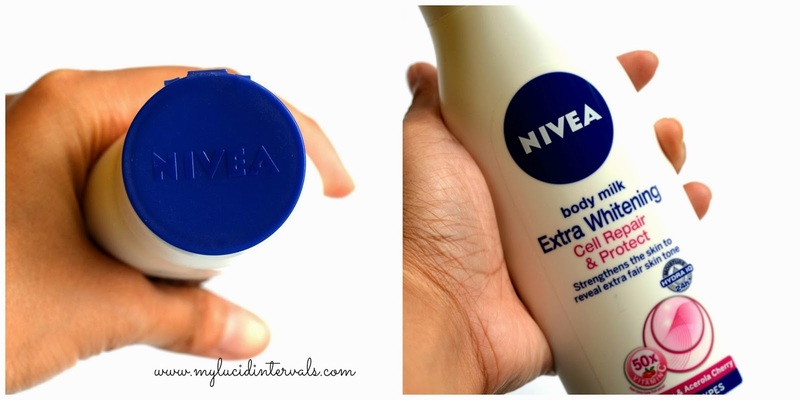 I've always loved Nivea ever since and I love it cause I can buy it with my 'baon'! Haha, I love it so much! That's the strength pf Nivea. It's their longevity in taking care of the skin and hair. Hello. How did you get the treats? Gusto ko rin niyan. Haha.